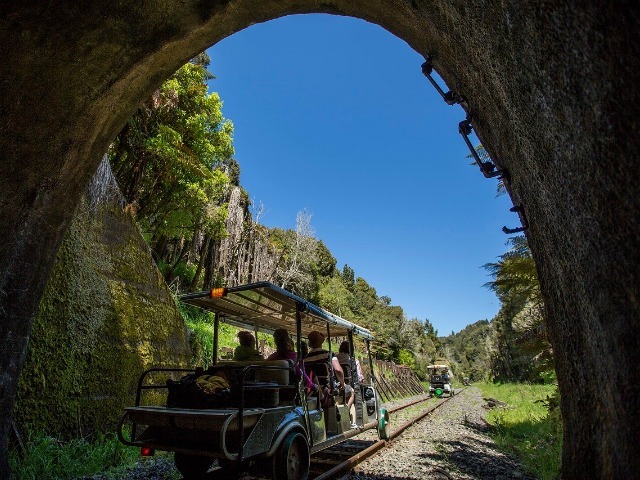 Inspired by the Otago Rail Trail, take an adventure down raw and beautiful Stratford to Okahukura railway line. Construction began in 1901 and took over 32 years and 24 tunnels build, all of which were carved using pick axes and shovels. Explore the rugged country these early settlers experienced with Forgotten World Adventures. Self-driven rail tours along this now decommissioned railway line. A journey worth taking, you’ll visit many historical sites and hidden valleys only accessed via rail. Book your trip today. Journey back in time through stunning hill country farms and native bush. Hear stories of the rail workers aboard a self driven Rail Cart. Our most popular tour, this full day experience immerses you in the Forgotten World, breathtaking landscapes and its rich history. 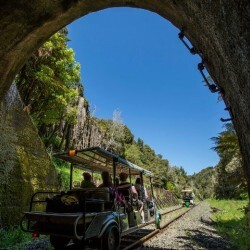 Enjoy the best of both worlds, encountering 10 tunnels and 20 bridges, as you travel 40km by rail and 23km by Jet Boat on the Whanganui River. Starting in Douglas, explore the far end of the Forgotten World. Uncover stories of the workers and the history of the old Okahukura-Stratford line. Enjoy the scenery of the changing rural landscapes including, forests and farms and get up close and personal with the local wildlife. Unplugged yet still 'on the line' as you travel the entire 142km from Okahukura to Stratford or Stratford to Okahukura with an overnight stay. Experience the Forgotten World from every angle, joining us on the Rail, River, Helicopter & Trails to truly embrace the magic of this spectacular region. Experience deep gorges masked in native bush and banks encased with ferns, caves and waterfalls on this full day Jet Boat experience. Experience rock strewn rapids by Jet Boat as you travel down the majestic Whanganui river to Lauren’s Lavender farm. Adventure by Jet Boat skimming through rapids of the Whanganui River and enjoy the breathtaking scenery of farmland and bush clad hills.